Near Amsterdam and tourist attractions such as Volendam, Marken, Edam, Monnickendam and scenic Broek in Waterland is the luxury group accommodation and B & B Hoeve Chapeau. Located on the Gouwzee, Hoeve Chapeau is the perfect base for city trips, bike rides and walks. The space, private garden and complete equipment make guests feel so spoiled to say goodbye effort. Are you looking for a central accommodation with the rural charm of a farmhouse with all modern conveniences? Then come to Hoeve Chapeau! Hoeve Chapeau is a farmhouse and offers on the ground floor five spacious rooms with private bathroom with tub and / or (steam) shower. Guests can make use of the light garden room with luxury kitchen, TV and access to the terrace and private garden with barbecue. Hoeve Chapeau is also very suitable for younger guests. With a trampoline, swings and sand pit on the field behind the farm there is always something to do. Or check if the cows are in the barn, where you sometimes can witness the birth of a calf! A group of friends decided to take a break and assembled from different parts of the globe for an overdue catch up for a week. House is well equipped, nicely maintained, in a very quiet area (adequately outside Amsterdam city for occasional visits) and close enough to some of the best villages (with nice pubs and restaurants) to visit in the Netherlands. Some of us, directly or indirectly, will stay at the house again in future. This is a particularly great place for a group. There are 5 bedrooms, each with an en suite bath, and all very comfortable. The communal living area is spectacular! Very well equipped kitchen, huge table that seats 12 easily, lots of sitting space around it, opens to a very nice private garden. We had 5 couples and loved that we could be here together. Trudy was very helpful and accommodating. It's about a 10-minute walk, followed by a 20 minute bus ride to get to the central train station and center of town. Thank you very much for your kind words. We would love to welcome you again in the future. Hoeve Chapeau is a beautiful house that can accommodate a large family group or a group of friends. The house is very comfortable and is in a good location to visit many places in the Netherlands. Trudy, the owner is very helpful with answers you might have concerning your visit to the country and of course the region of the house. We would surly recommend this house for a vacation. Great house, clean, very nice, close to the cheese factory and Trudy was super helpful. Thank you again for your stay at our house. We hope to welcome you and your family some other time in the future. Enjoy Europe! Perfect place for relaxation and a reunion of friends! This place is a terrific find! 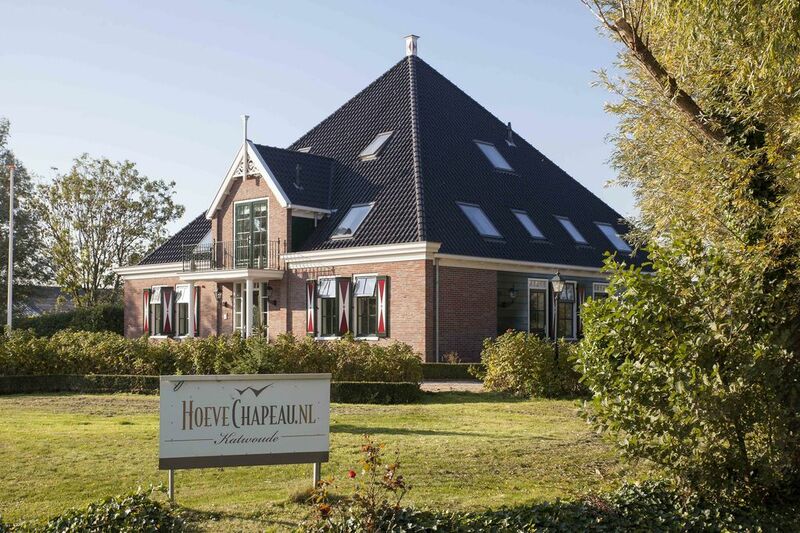 After looking for an in-city place for a group reunion, we decided on Hoeve Chapeau for it's charm and affordability. The house was immaculately clean, well designed for bedroom privacy as well as visiting together, nicely equipped for cooking, well heated, great parking, as well as quiet and attractive. The drive to Amsterdam is very short and easy on the A10. We parked at the Train Station and enjoyed the city very easily. Trudy, the owner was so friendly and available, and even brought a lovely welcome cake. We would highly recommend this home for a great spot to see Amsterdam and the countryside too! Amazing stay for a group! My weekend here with a large group was really great! Trudy was very communicative and accommodating. She had everything ready before we arrived. Due to my schedule, I had to check in 6 hours early and Trudy was able to make it work. The property itself was great. Lots of beautiful green areas around. It is surrounded by farms, but isn't that far off of a major road. The house is about a 10 minute walk to a bus that goes directly to downtown Amsterdam (about a 20-30 min journey depending on traffic) and grocery stores and other shops are right down the road in the next town (about a 5-10 min drive from the house). Inside, everything was very well kept and absolutely spotless. The house has a very expansive kitchen & social area which was where we spent most of our time (you can see it pictured in the photos). The bedrooms are all very spacious and we had no problem getting everyone their own beds. The beds were pretty comfortable as well. The appliances throughout the property were very well kept and we had no trouble cooking, showering, and generally hanging out and having fun. Outside there is even a grill with some lawn furniture for a cookout or something similar. Overall my stay here was awesome! Trudy really made sure that we had a wonderful time and had everything we needed. If we had any questions we could contact her directly as she lives close by. If I'm back in Amsterdam with a larger group of people, I will absolutely be contacting Trudy again to stay here. One thing I should mention for prospective travelers booking this property is to definitely bring mosquito repellent/spray and citronella candles to keep the mosquitos away. The property is surrounded by water and the bug screen door didn't do the best job of keeping the mosquitos out at night. Our entire group had tons of bites by the end of the weekend. This isn't the owner's fault, really - just mainly because of the area and the water. Thanks again to Trudy for making my group's experience an awesome stay. I hope to be back again next year!! • Amsterdam - in our capital is always something to do. • Volendam - known for its fish 'typical Volendam' and costume: a visit to Volendam is part of it. • Edam - who knows the Edam cheese is not it? In summer, every Wednesday an old cheese market. • Cheese farms - in this region, many cheese farms where you can see how the traditional way cheese is made and, of course, a variety of cheese can be tasted. • Zaanse Schans - go back to the 18th and 19th centuries and visit the typical old Dutch houses and windmills at the Zaanse Schans (www zaanse schans en..). • Monnickendam - with its beautiful stately homes and monuments can still see that Monnickendam was once an important trading town. • Broek in Waterland - known for its pastel-colored houses, this village was in the 17th and 18th century as a home for prosperous merchants. • Marche - this peninsula was only linked to the mainland in 1957. The landscape and wooden houses on mounds and piles invite you for a walk or bike ride. De tarieven zijn inclusief BTW en gebaseerd op 12 personen. De borg wordt na vertrek bij geen schade/vermissing binnen een week teruggestort.